LAS VEGAS, Oct. 26, 2017 /PRNewswire/ -- Australia's HUMAN NATURE have earned their place as one of the world's finest pop vocal groups of the modern era, and as award-winning Las Vegas resident headliners with their distinctive harmonies and stellar live shows. The fantastic foursome has announced that they will be taking their smash hit Las Vegas show "Jukebox" on the road in March 2018. The tour will support the release of their new studio CD, "JUKEBOX – The Ultimate Playlist" which is available November 3 on Legacy Recordings, a division of Sony Music Entertainment and, their PBS special, "HUMAN NATURE: Jukebox – In Concert from the Venetian," which debuts Thanksgiving weekend. 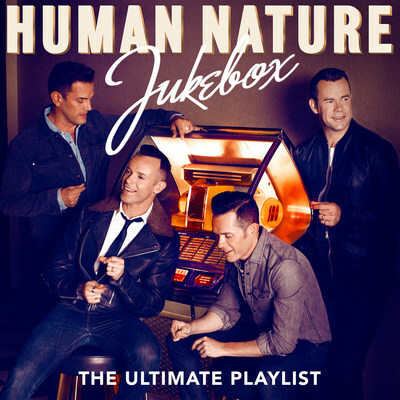 "We are so excited to bring our 'Jukebox' to cities across the USA with our national tour, CD and PBS special," said Toby Allen of HUMAN NATURE. "We have so many fans that come to our show at The Venetian in Las Vegas ask us when we will be coming to a city near them, and now, through the television special and tour, we can now take our show on the road from New York to California." "Jukebox" has been praised by critics and fans for its broad musical offering and flawless production being declared "an incredibly addictive evening of entertainment." The show effortlessly mixes pop classics from their back catalogue with Doo-wop, Motown, Soul standards and more - offering the ultimate playlist - live! HUMAN NATURE'S foursome, Toby Allen, Phil Burton and brothers, Andrew and Mike Tierney, are joined on stage by a dynamic band, The Jukebox All-Stars, and world-class dancers, as they celebrate a mix of musical genres that covers classic hits as well as chart topping hits of today. "Jukebox" is not only a playlist of the groups influences, but some of the most-loved hit songs from the best vocal artists and groups of all time, including "Why Do Fools Fall in Love," "Stand By Me," "Unchained Melody," "Higher and Higher," "Dance To The Music" and "Under The Boardwalk." They show that this "Jukebox" plays everything from The Temptations to Timberlake, from The Beatles to Bruno Mars. 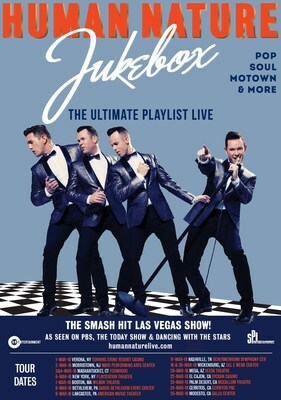 The PBS special, "HUMAN NATURE: Jukebox – In Concert from the Venetian," is inspired by and based on the group's two Australian multi-platinum selling albums Jukebox and Gimme Some Lovin,' which feature classic '50s and '60s pop standards. The albums were executive produced by the legendary Bob Rock (Michael Bublé, Metallica) and produced by David Pierce (Michael Bublé, Robbie Williams). Pierce joined HUMAN NATURE at The Venetian as a musical collaborator for the JUKEBOX experience. The songs were originally either penned or performed by the likes of The Beach Boys, The Beatles, The Righteous Brothers, Fontella Bass and more. In addition, the group have also included two new 'modern classic' on the album, original tunes, 'End of Days' and 'Forgive Me Now'. Human Nature's, career statistics are staggering. Since signing to Sony Music Australia over two decades ago, Human Nature have sold more than 2.5 million albums, earned 27 platinum awards, scored 17 Top 40 hits and have had five Top Ten tracks worldwide. Standout moments in Human Nature's career to date include performing to a global audience at the Sydney Olympics in 2000, opening for Michael Jackson and Celine Dion at concerts around the world and appearing on television in the USA on shows as varied as The Talk, Today Show, Oprah, and Dancing With The Stars as well as their own PBS specials Human Nature Sings Motown and the forthcoming Human Nature "Jukebox: In Concert from The Venetian."